Melayna, who is now six months old, has decided to do things just like her brother. Just a couple of days after turning six months her first tooth made its appearance. Melayna hasn't been really showing any signs of teething besides massive amounts of drooling, enough to rival Niagara Falls, and the automatic impulse to stick everything and anything in the mouth. So, I wanted to capture the moment even though you really can't see the tooth yet (it just cut through the surface). I get the camera out. Sit right in front of a open window and attempt to take pictures with one hand while pulling her lip out of the way with the other. But there was a problem... My daughter has a weird thing with blowing raspberries and sticking her tongue out. She loves it. If there is something near her mouth, she wants to stick her tongue out and try to lick it. What a goober! By the way, did you notice her eyes? Definitely takes after her daddy. 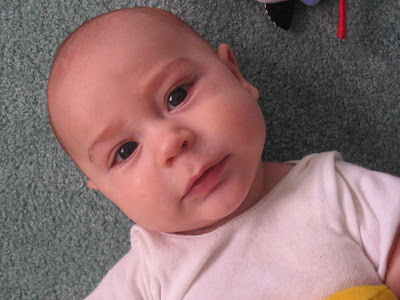 Tristan's eyes were dark pools of brown by this age. Here's a picture of him just a week or so short of six months. I DID notice how beautiful her eyes were!! And BIG! What a sweetie! So, is she cranky enough for you with the toother coming in? ?